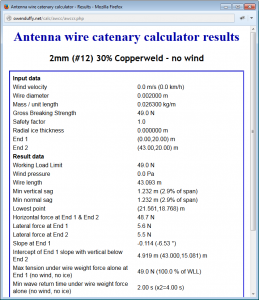 Correspondents have asked about application of the technique used in Antenna span spring tensioner using Antenna wire catenary calculator to a span tensioned with a counterweighted halyard. The scenarios bear a lot of similarity, the main difference being that the tension from the counterweight is constant up to the point that the counterweight travel reaches its limit. The tension applied is the weight force of the counterweight with a little increase to allow for friction in the sheave block. 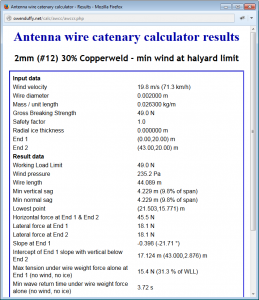 So, lets say the scenario is a 42m wire plus halyard that adds 1m to the span under no wind conditions and can pay out a further 1m at which it reaches its limit. Lets say the counterweight is 5kg weight so 49.0N tension. 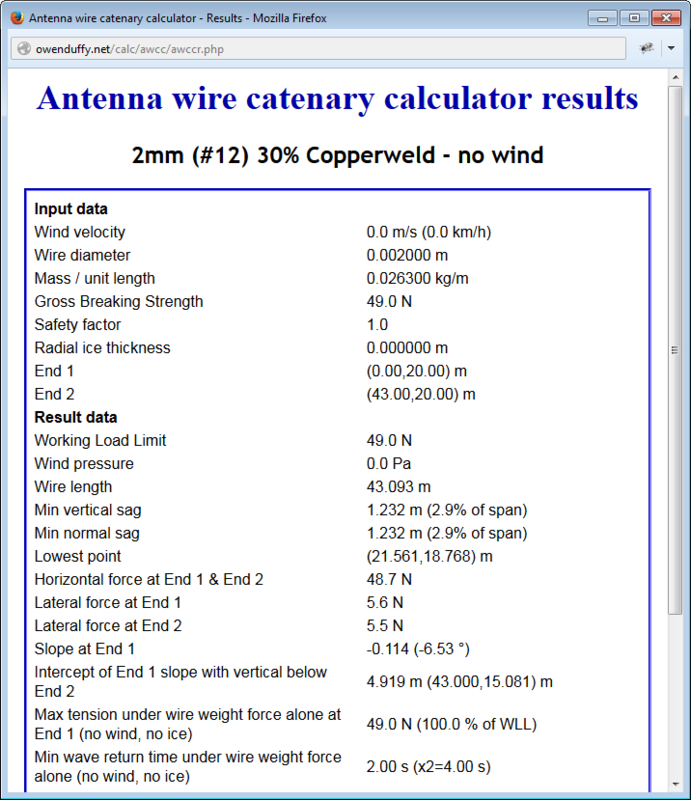 Above is the no wind scenario, total ‘wire length’ is 43.1m. Now lets increase wind until a further 1m of halyard pays out. Above is the wind at 19.8m/s which just increases the ‘wire length’ by 1m. 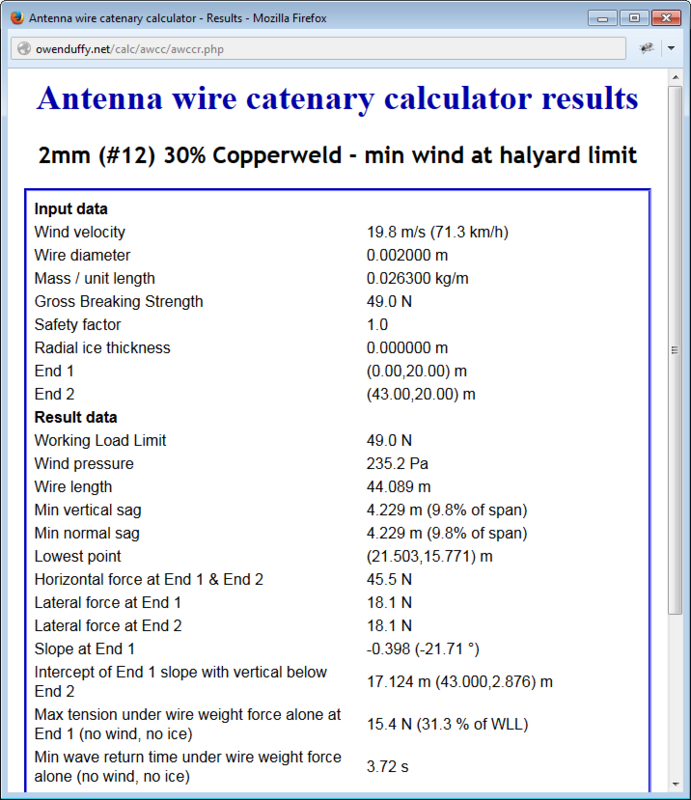 Now lets assume that the wire is the weakest element in the system, we can calculate the wind survival (with the halyard fully paid out). 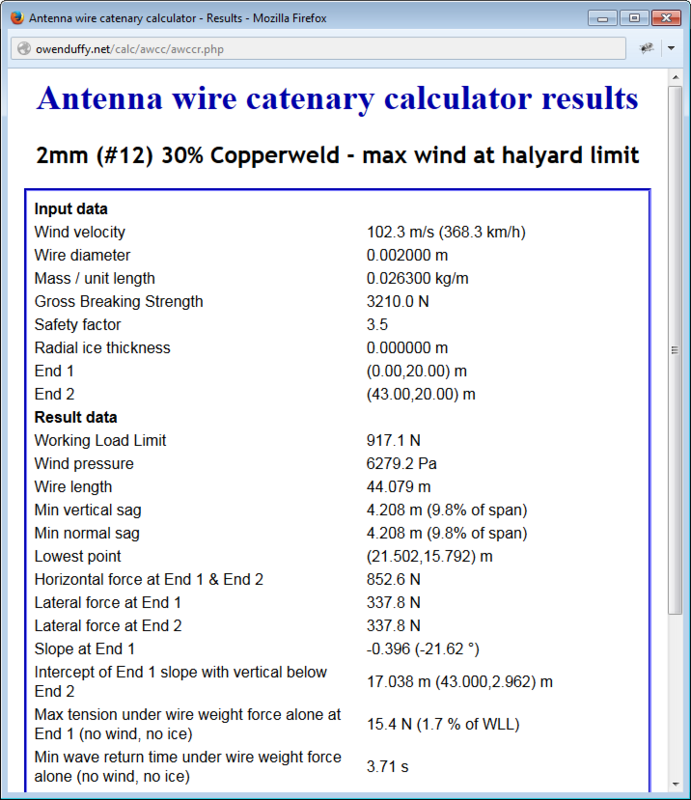 Above, with normal wire strength and safety factor, increasing wind until ‘wire length’ includes the fully paid out halyard, wind survival speed is 102m/s. So, the arrangement allows a flatter span under no wind, but pays out span length to survive high winds. It seems a good idea, but experience proves that these systems fail mechanically and under some wind conditions, the dynamic forces become relevant and the system is less tolerant than the above static analysis reveals. The analysis assumed fixed supports, and the situation is different where one end of the span might be tied off to a tree which moves in the wind. In that case, some form of accommodation of the support movement might be a necessary evil… I have done it myself, here at a holiday cottage. 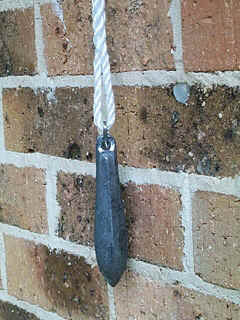 Above, the sheave block for a small counterweighted halyard. 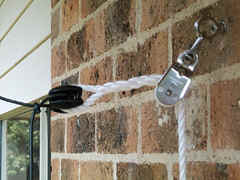 All stainless steel and nylon hardware, large rope (6mm) that is less likely to jam in the block, and reachable from a balcony to check that it is free running. In this case, a 1lb (0.45kg) Snapper lead was used for the counterweight, quite sufficient for a shortish and almost vertical span.